To get up close to the action, go for a seat in our Pit (-1). To secure an eye-level view, select our Dress Circle (0) or, for a great value spot, choose our Upper Circle (1) or Gallery (2). For more information about our seating plans, phone our Box Office on 0117 987 7877 or email tickets@bristololdvic.org.uk. 1766 Bar & Kitchen, the Foyer and Box Office are completely step-free. Access to Coopers’ Hall, Coopers’ Loft and The Weston Studio (both Floor and Balcony levels) is step-free, via the Foyer lift. Access to seating in The Weston Studio (both Floor and Balcony levels) is step-free. Access to toilets on the Studio Floor level is step-free, via the Foyer lift. There is step-free access to each Theatre level entrance (apart from the Gallery) via the Foyer lift. Only the Dress Circle in the Theatre has step-free access to seats. 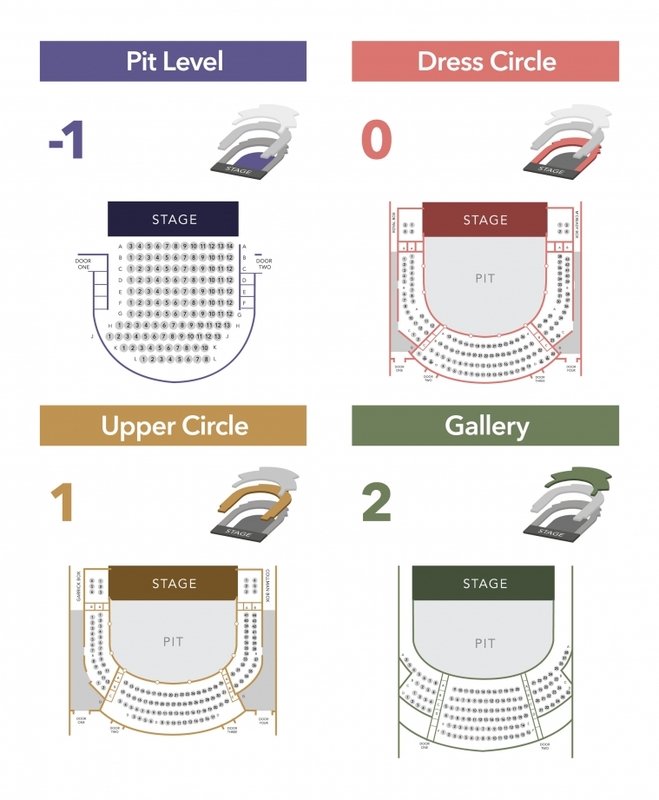 All other levels, Pit, Upper Circle and Gallery have steps in their seating areas. (See step count info below for more info). From the Foyer ground floor, there are 10 steps down to the Pit level and Studio Floor level. There are 5 steps to the Dress Circle from ground. There are 29 steps to the Upper Circle. There are 43 steps to the Gallery. There are 66 steps to Coopers’ Loft. The Foyer lift (on the right hand side of the foyer beyond the Box Office) can be used to avoid steps to all levels. Pit: From Pit Level to Pit seats, there are 8 ascending steps. The Pit is not step-free (there is no lift inside the auditorium). Dress Circle: row C is step-free. There are 2 steps down to row A, 1 step down to row B and 1 up to row D (row D is step-free from Door 4). Wheelchair spaces are located in the Dress Circle. Upper Circle: there are 2 steps up to get to the back of the Upper Circle. There are then 3 steps down to get to each row. The steps are quite steep. Gallery: to get to the auditorium right entrance there are 5 steps up to it. To get to the auditorium left entrance there are 15 steps. The entrances bring you in at row E. There are then 3 steps down to get to each row. The steps are very steep. Find more Access information here.